Viper – Industrial Belting – LEGG Company, Inc. The yarns in plain woven fabrics have a natural crimp. 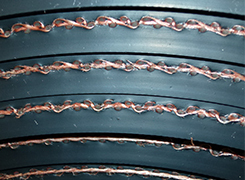 Once the belt is put under tension, this crimp is pulled out; resulting in unwanted belt stretch. The straight warp yarns of the VIPER and VIPER II fabric range have no need to straighten out like that of crimped yarns, thus eliminating much of the initial belt stretch. VIPER and VIPER II provide for maximum load support, yet remain quite flexible for high tension constructions. This makes our Viper line a great choice for wide conveyors, as well as, narrow, high tension conveyors of long distances. By packing tremendous break strength into the one or two plies of the VIPER or VIPER II, Legg must use very large yarns. These yarns, in addition to the unique fabric construction, are much more resistant to rip, tear, and puncture than the lighter yarns found in plain woven belt fabrics which require three, four, or five plies for equal strength. 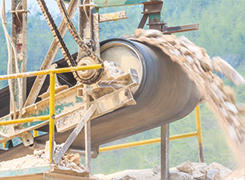 Once the belt has been vulcanized with premium rubber covers, and a thick rubber skim for two ply constructions, the belt is fully equipped to dampen impact forces and will absorb stresses put on the belt by large/heavy materials.